Dream Pod 9: HGB Peace River & NuCoal Kickstarter Final 19 Hours Update! With 19 hours left to go in the Kickstarter we are at $38,712 CAD pledged, just $11,288 CAD more to unlock Stretch Goal 09 at $50K CAD, that we are committed to reaching. Which is 113 more Backers at our $100 CAD Badlands Commander Reward Level. We'll run an extra funding campaign if needed after the Kickstarter ends using our Pledge Manager to raise the remaining pledges from outside Backers to get SG 09 unlocked and pay for the second plastic injection mold. We made an updated Badlands Commander Reward Level graphic showing the 2 patches and 36 plastic miniatures that Backers will receive once SG 09 is unlocked, check it out below. Thank you to all our Backers for your amazing support of the Heavy Gear Blitz Peace River & NuCoal Core Plastic Miniatures Kickstarter. We'll do more updates as Stretch Goals are unlocked in these final hours. 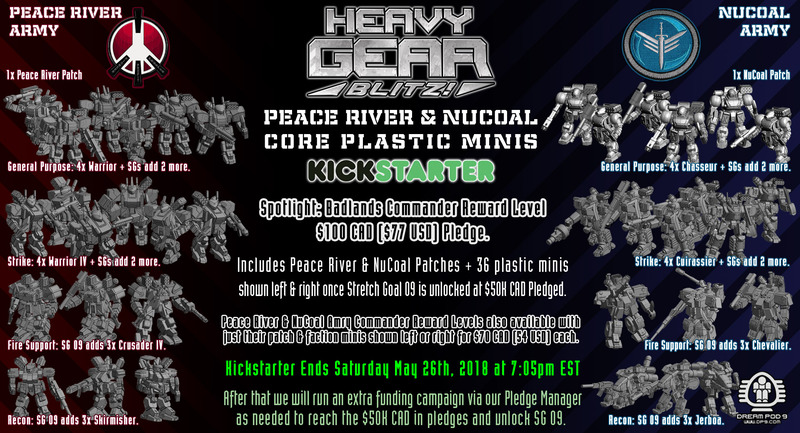 Click the Heavy Gear Blitz Peace River & NuCoal Plastic Miniatures Kickstarter (Ending Saturday May 26th, 2018 at 7:05pm EST) link below and show your support. Home › Blogs › Robert Dubois's blog › HGB Peace River & NuCoal Kickstarter Final 19 Hours Update!